In Max Brooks’ world, a decade has passed since the zombie apocalypse and the human race has just barely survived. The zombie outbreak has been contained and now humans are trying to piece together the entire story. How did this all begin? Why were we so woefully unprepared? How did humankind manage to come back from the brink of extinction? Using individual accounts of people from all over the world, World War Z tries to answer all of these questions, along with many others, in an attempt to illuminate where things went horribly wrong. For if something like this should ever happen again, next time we may not survive. I have to admit, I was slightly skeptical when I first read the description of World War Z. Zombies? I enjoy post-apocalyptic and historical fiction as much as the next guy, but the living dead? It didn’t really appeal to me. It was a New York Times bestseller, though, and had received glowing reviews from almost every single critic, so I decided to read a few chapters right in the middle of the bookstore. I didn’t leave my spot in the aisle for two hours. Then I bought it, took it home, and finished it that day. Maybe to save a few bucks I should have just stayed in the store. It’s that quick of a read. The author takes us on a trip around the globe, exploring stories from the United States, South Africa, Israel, Japan just to name a few. The individual accounts are wide and varied: a soldier, who was on the front lines of the first battle when they realized that Cold War tactics are useless; a profiteer, who made a fortune selling placebos; a volunteer, who was just a girl when the outbreak started, but is now an experienced zombie killer; and numerous others. The author uses these narratives to weave together a story that also explores the social, psychological, environmental, religious, and economic impact the zombie war had on the human race. As a result, World War Z takes on an extremely realistic tone that is chilling and all too creepy. Perhaps the only problem I had with the book was that it wasn’t long enough. While the author did an excellent job of incorporating a vast multitude of people and civilizations with unique perspectives and voices, there were many more perspectives I would have liked to hear from. I suppose that’s the problem with writing a history book, even if it is a fictional one: some stories have to be left out. 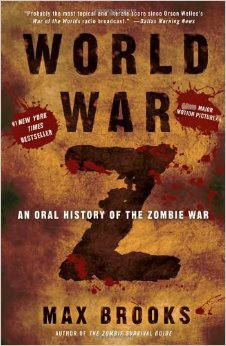 That being said, World War Z is an incredible book that I would recommend to anyone and everyone. It is not just a book about zombies. World War Z is one of the cleverest social commentaries I have ever read, an examination of the human condition when pushed to the extreme, and a frighteningly realistic portrayal of a devastated world. In the end, World War Z is about us: human beings.